Calling all cycling fans. Think Oregon. And think of Oregon’s newest Scenic Bikeway to be designated in Southeastern Oregon. It’s the Oregon Outback Scenic Bikeway and it showcases the wide open beauty, wildlife, and tranquility of that area. The Oregon Parks and Recreation Commission formally approved designation recently. The route is nestled in the beautiful Warner Mountains where the forested Cascades meet the high desert basin and range. Bicyclists have the opportunity to view the high peaks, sheer cliffs and gorgeous lakes. There, they can experience quiet and ample solitude, shared only with pronghorn antelope, wetland birds, bighorn sheep and sage grouse. The vibrant and friendly southern Oregon town of Lakeview serves as the start and finish of the Bikeway. Lakeview, at a lofty 4,798 feet above sea level, has a walkable and beautifully shaded main street with restaurants, lodging and camping nearby. This ride is best enjoyed in spring and fall when nature is at its finest in this region. It is a photographer’s dream location. Spring snow melt draws wildlife and migrating birds to the lakes, while beautiful wildflowers bloom on the hillsides. In the fall, the backdrop of brilliant yellow aspen light up the hillsides. Antelope and mule deer cavort openly as mating season ensues. The Oregon Scenic Bikeway program is a superb collection of cycling routes that inspires people to experience Oregon’s natural beauty and cultural heritage by bicycle. The increased tourism offers economic and social benefits to the communities and residents along the routes. How do bikeways become bikeways? Local bicyclists propose new bikeways, and the Oregon State Parks and Recreation Commission designates routes based on scenic quality, road conditions and general riding enjoyment. 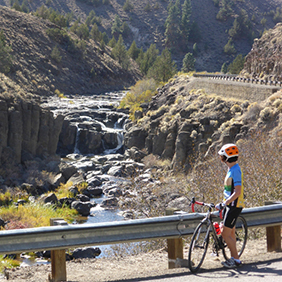 Only the best routes meet the selective criteria developed by the State Scenic Bikeway Committee. Once designated, OPRD pays to install directional signs along the route. OPRD and Travel Oregon post information online for riders to plan their trip. Printable ride maps, elevation profiles, services and points of interest as well as Travel Oregon’s Bike Friendly Businesses recognition program are included. The Oregon Scenic Bikeways program is the first and only of its kind in the country. Launched in 2005, the program is a partnership between Cycle Oregon, Travel Oregon, Oregon Department of Transportation and OPRD. All the information cyclists need to plan their ride can be found on RideOregonRide.com/Outback, including a printable map, GPS data, camping and other accommodations and amenities along the route. The Oregon Tourism Commission, dba Travel Oregon, works to enhance visitors’ experience by providing information, resources and trip planning tools that inspire travel and consistently convey the exceptional quality of Oregon. The commission aims to improve Oregonians’ quality of life by strengthening economic impacts of the state’s $10.8 billion tourism industry that employs more than 105,000 Oregonians.